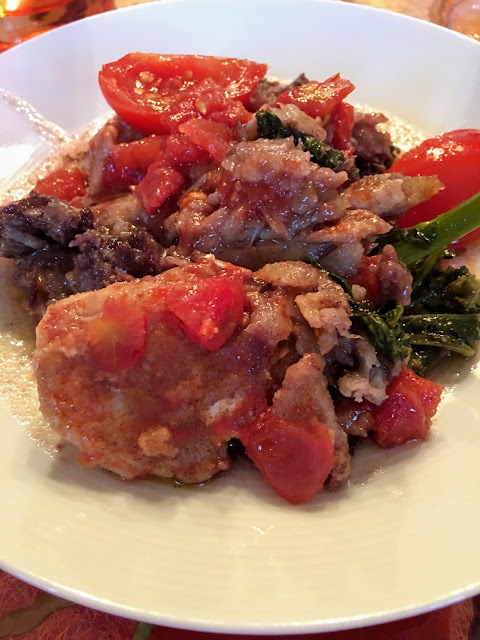 BACCALA WITH GARLIC AND BROCCOLI RABE: I used the 2 pounds of boneless salted cod (baccala) called for in this recipe from Whole Foods Market, plus garlic, tomatoes, wine and a big head of organic broccoli rabe. The codfish was boiled three times to remove the salt, then 2-inch chunks were dredged in a little flour, fried and turned over. ORGANIC PASTA AND WILD SHRIMP DRESSED WITH PESTO: I used a 1.1-pound package of Garofalo Organic Casarecce Pasta from the Costco Business Center in Hackensack, 1.5 pounds of cleaned wild-caught Key West White Shrimp, sold frozen at Whole Foods Market; and dressed them with plenty of Kirkland Signature Basil Pesto from Costco. Editor's note: The first version of this post included a video that didn't play and a number of typos, but I've fixed them and included a link to the cooking video at Victor's Healthy Kitchen on YouTube. HACKENSACK, N.J. -- All that's left is a celebratory meal out today (New Year's Eve) before I can return to eating normal amounts of food. And return to baking small sweet potatoes, a bread substitute I can eat to my heart's content without worrying about gaining weight; or another great side dish, an electric cooker full of organic quinoa with organic diced tomatoes and plenty of garlic. Yes. I love to eat, and I'm happiest when I'm eating. But we simply buy too much food, and I can no longer dismiss all that shopping by saying it's good exercise, especially if you park far from the supermarket or warehouse entrance, as I do. We've tried to ignore the profiles of pastry chefs in newspapers, even as some of them have published entire sections devoted to pie, and continue to avoid too much sugar, salt, butter and other saturated fat. My wife and I don't compete in the kitchen, but on some nights we prepare two meals, because I've eaten only heart-healthy seafood for the last decade, and she and the rest of our family eat meat and poultry, as well as fish. So, on Thanksgiving and Christmas, we ended up with too many entrees (a half-dozen), and I am still eating leftovers from a Feast of the Seven Fishes I prepared for last Tuesday's meal. A tuna-sardine salad dressed with Dijon, lemon juice and cumin; silken slices of smoked wild Alaskan Sockeye Salmon from Costco Wholesale, and leftover fried squid from a Lotus Cafe delivery (total of 4 fishes). My annual battle of the bulge is trying to stay under 200 pounds, and this morning, I tipped the bathroom scale at 200.4 pounds -- down from 205.6 pounds. I had dipped under 200 pounds just before Thanksgiving, meaning I needed nearly 3 months to lose the weight I had gained on a 15-day vacation in Alaska in August, where we ate three big meals a day. I made reservations for tonight at Rosa Mexicano, the fine-dining restaurant in Hackensack, where we'll order a la carte to avoid the desserts served with the fixed-price holiday menu. Still, I'll need willpower to avoid eating too many of the scrumptious little corn tortillas (usually made in the dining room) with our guacamole and other food. And, of course, I won't be able to resist ordering a bottle of Negra Modelo, one of Mexico's great beers. On Sunday morning, I made an egg-white omelet to use the last wild-caught shrimp and some leftover sauce from our Christmas dish of Organic Pasta dressed with Basil Pesto. I still have a little bit of the Baccala with Garlic and Broccoli Rabe, and some of that tuna-sardine salad, but it will be futile trying to get anyone else to eat them. NO-FLIP FRITTATA WITH PASTA PESTO: The day after Christmas, I used leftover organic pasta with shrimp and pesto, plus egg whites, to make a no-flip frittata covered with grated parmesan, tomato slices and spoonfuls of pesto. See this how-to video. 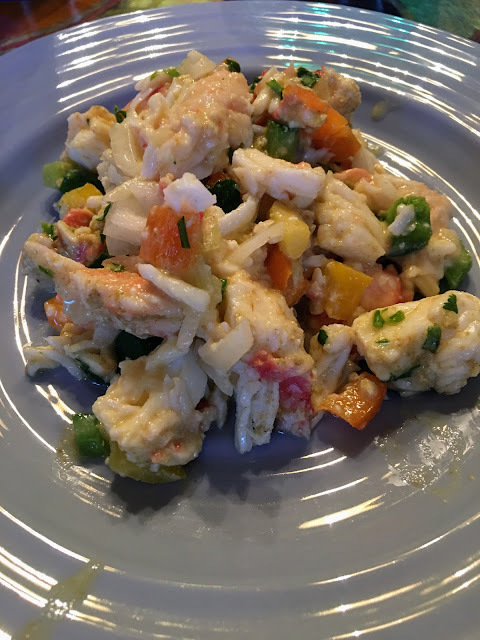 GIVING THANKS FOR RED KING CRAB: For Thanksgiving, I prepared a salad of cooked Red King Crab and diced sweet peppers dressed with Dijon mustard, fresh lemon juice and ground cumin. VEGAN PLATTER: I also ordered a vegan Thanksgiving meal from Whole Foods Market in Paramus, including a head of cooked cauliflower, center; squash, chickpeas and dressing, all of which required reheating in the oven. We decided to throw away the dessert, which was way too sweet.